The Life of Osborn H. Oldroyd. Founder and Collector of Lincoln Momentos . by Wm. Burton Benton. 31 pgs. Beresford Pr. Washington DC. 1927. Oldroyd was Sergeant of Co. E, 20th Ohio. Thanks to Larry Strayer for this source. Organized for three months service in May, 1861, and for three years, October 21st, under Colonel Charles Whittlesey, it served in Kentucky until February, 1862, when it moved to Fort Donelson and participated in that battle; and at Shiloh, fought in Lew Wallace's Division. In June it garrisoned Bolivar, Tennessee, where it checked the advance of a large Rebel force. In December it advanced into Mississippi, returned to Memphis in February, 1863, and joined Grant at Vicksburg. In Grant's movements about Vicksburg, the 20th fought at Raymond, Jackson and Champion Hills, and afterward joined the investment. In January, 1864, the Regiment re-enlisted as veterans and joined the Meridian expedition. In June it joined Sherman in his Atlanta campaign, and in the great battle of July 22nd, was nearly surrounded by a superior force of the enemy, but fought its way out. It marched with Sherman to the sea and through the Carolinas, passed in review at Washington, and was mustered out at Louisville, July 18th, 1865. The 20th was famous as a fighting Regiment and had gallant material in officers and men. 20th Regiment Infantry (3 Months). Organized at Columbus, Ohio, April and May, 1861. Mustered in May 23, 1861. Ordered to West Virginia, and attached to Kelly's Command. Action at Richter June 23. Pursuit of Garnett July 15-16. Duty along Baltimore & Ohio Railroad till August. Mustered out August 23, 1861. 20th Regiment Infantry (3 Years). Organized at Columbus, Ohio, August 19 to September 21, 1861. Moved to Camp King near Covington, Ky., and mustered in October 21. Duty at Covington and Newport, Ky., till February 11, 1862. Attached to 3rd Brigade, 3rd Division, Army of the Tennessee, February to May, 1862. 2nd Brigade, 3rd Division, Army Tennessee, to July, 1862. Unattached, District of Jackson, Tenn., to November, 1862. 2nd Brigade, 3rd Division, Right Wing 13th Army Corps (Old), Dept. of the Tennessee, to December, 1862. 2nd Brigade, 3rd Division, 17th Army Corps, Army of the Tennessee and Army of Georgia, to July, 1865. SERVICE.--Investment and capture of Fort Donelson, Tenn., February 14-16, 1862. Expedition toward Purdy and operations about Crump's Landing, Tenn., March 9-14. Battle of Shiloh, Tenn., April 6-7. Advance on and siege of Corinth, Miss., April 29-May 30. Guard duty at Pittsburg Landing till June, and at Bolivar, Tenn., till September. Action at Bolivar August 30. Duty in the District of Jackson till November. Grant's Central Mississippi Campaign November 2, 1862, to January 10, 1863. Action at Holly Springs, Miss., December 21, 1862. Lafayette, Tenn., January 14, 1863. Moved to Memphis, Tenn., January 26, thence to Lake Providence, La., February 22, and duty there till April. Movement on Bruinsburg and turning Grand Gulf April 25-30. Battle of Port Gibson, Miss., May 1. Forty Hills and Hankinson's Ferry May 3-4. Battle of Raymond May 12. Jackson May 14. Champion's Hill May 16. Siege of Vicksburg May 18 to July 4. Assaults on Vicksburg May 19-22. Surrender of Vicksburg July 4. Duty at Vicksburg till February, 1864. Stevenson's Expedition to Monroe, La., August 20-September 2, 1863. Expedition to Canton October 14-20. Bogue Chitto Creek October 17. 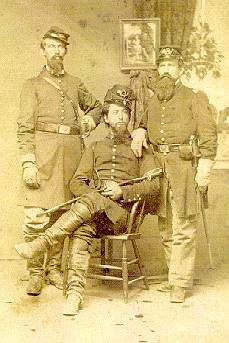 Regiment reenlisted January 1, 1864. Meridian Campaign February 3-March 2. Canton February 26. Veterans on furlough March and April. Moved to Clifton, Tenn., thence march to Ackworth, Ga., April 29-June 9. Atlanta (Ga.) Campaign June 9 to September 8. Operations about Marietta and against Kenesaw Mountain June 10-July 2. Assault on Kenesaw June 27, Nickajack Creek July 2-5. Howell's Ferry July 5. Chattahoochie River July 6-17. Leggett's or Bald Hill July 20-21. Battle of Atlanta July 22. Siege of Atlanta July 22-August 25. Flank movement on Jonesboro August 25-30. Sandtown August 28. Battle of Jonesboro August 31-September 2. Lovejoy Station September 2-6. Operations against Hood in North Georgia and North Alabama September 29-November 3. March to the sea November 15-December 10. Siege of Savannah December 10-21. Campaign of the Carolinas January to April, 1865. Pocotaligo, S.C., January 14. Barker's Mills, Whippy Swamp, February 2. Salkehatchie Swamp February 3-5. South Edisto River February 9. North Edisto River February 11-13. Columbia February 16-17. Battle of Bentonville, N. C., March 20-21. Occupation of Goldsboro March 24. Advance on Raleigh April 10-14. Occupation of Raleigh April 14. Bennett's House April 26. Surrender of Johnston and his army. March to Washington, D.C., via Richmond, Va., April 29-May 20. Grand Review May 24. Moved to Louisville, Ky., June. Mustered out at Louisville, Ky., July 18, 1865. (A detachment participated in the Battle of Nashville, Tenn., December 15-16, 1864.) Regiment lost during service 2 Officers and 87 Enlisted men killed and mortally wounded and 4 Officers and 267 Enlisted men by disease. Total 360.